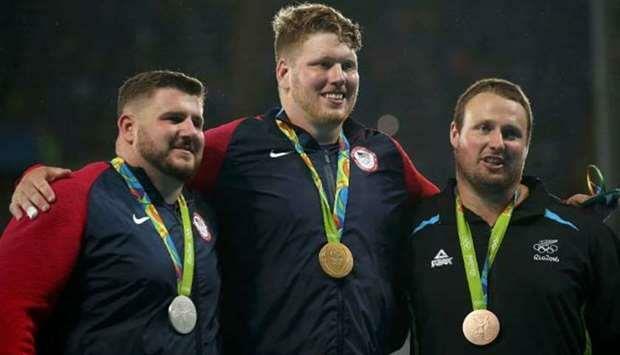 (MENAFN - Gulf Times) The men's shot put was one of the highest quality events across the athletics programme last season and six of the seven throwers who surpassed the 22- metre line will be competing in the Doha Diamond League on May 3. 'Breaking the Diamond League record in Zurich to win the Diamond League title was one of the highlights of my season. Of course, I have very high expectations this year as well and I have been pleased with my performances so far in 2019, said Walsh. 'I expect a very tough competition in the Khalifa International Stadium on May third and I think I will have to throw over 22 metres to take the win, said Walsh. 'I feel ready and I'm sure we will put on another great show for the crowd in Doha. 'This will be my first time in Doha and I am excited to throw in the Khalifa International Stadium. My two indoor competitions went very well and I am ready to put out some big throws outdoors, said Crouser, who threw 22.33m in his first competition of the season at the Millrose Games in New York. The line-up also features 2017 Diamond League champion Darrell Hill from the United States — who finished second to Walsh in Zurich last year with 22.40m — and Darlan Romani from Brazil who improved his South American record to 22.00m in 2018. The men's discus also boasts a star-studded line-up featuring world and European champion Andrius Gudzius from Lithuania, world and European silver medallist Daniel Stahl from Sweden and Olympic champion Christoph Harting from Germany. 'This will be my first international competition of the season and I know it will be another tough battle against a strong group of throwers including Daniel and Christoph who I have competed against many times in the past, said Gudzius. 'I am also looking forward to making my debut in the Khalifa International Stadium where I will be defending my world title later this season. Bulgaria's Mirela Demireva ended Mariya Lasitskene's 45-competition win streak in the Rabat Diamond League last July and the reigning Olympic and European silver medallist will be honing in on the second Diamond League win of her career in the high jump in Doha. 'I was sorry that I could not perform during the indoor season but I am looking forward to testing my shape against a strong group of jumpers at the Khalifa International Stadium, said Demireva. 'It will be an important season with the World Championships taking place in this stadium later this season. I have medals from the Olympic Games and European Championships but not from the World Championships so this is obviously my main objective for 2019. The line-up also includes Elena Vallortigara from Italy who fulfilled the promise she showed as a teenager a decade ago by improving her lifetime best from 1.91m to 2.02m last year. Former European indoor champion Airine Palsyte from Lithuania and Ukraine's Kateryna Tabashnyk, who cleared 1.99m during the indoor season, should also feature as well.